In today's heterogeneous computer environments, especially UNIX servers and workstations, it is essential that the system administrator have basic knowledge of different operating systems. 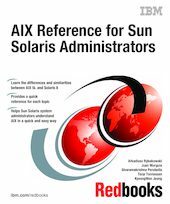 This IBM Redbooks publication is written for Sun Solaris administrators who wants to transfer their knowledge of Solaris UNIX skills to the AIX 5L operating system. This book will basically compare system administration tasks in Solaris 8 to AIX 5L Version 5.1. This book shows the reader similarities and differences between each operating system. This book will also introduce Solaris administrators to IBM eServer pSeries architecture. It is assumed that the reader of this book already has Solaris 8 system administration skills, and are familiar with Sun hardware. In the first section on each chapter, we will briefly mention how the Solaris tasks are carried out. In the last section on each chapter, we will provide a quick reference that will be in handy to use. This book is a valuable tool for system administrators and other technical support personnel who deal with AIX 5L and Solaris operating systems.